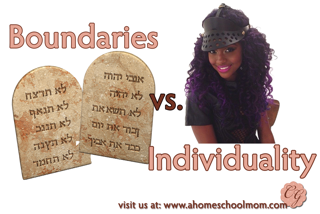 Boundaries vs. Individuality: Is There a Conflict Here? She was frustrated, it was written all over face. She wasn’t asking for the moon, merely an opportunity to make her own decision. My daughter had thought this through, felt she was able to accomplish the task, and only wanted the freedom to move forward. It was time to ask myself an important question: Was she crossing a boundary here or just expressing her individuality? You shall have no other gods before Me (the Lord). While this list could go on, by now, it should be pretty obvious where I’m going with this. We are to follow God’s commands, live righteously, and love our fellow man. If my child is living a life pleasing to the Lord, all else falls under the heading of individuality. But what about those choices I make for our household, the ones that aren’t ‘officially’ spoken of in the Bible; things like tattoos, staying out late with friends, dating, and more? Do these fall under the heading of boundaries or individuality? To this question, I would ask my child to look back at commandment (boundary) number five above: Honor your father and mother. As parents, we aren’t making decisions willy-nilly; we’ve made them through careful consideration and hours of prayer. Our children are commanded, and expected, to obey these boundaries understanding our choices are made with their best interests at heart. Each family needs to be on their knees in prayer, asking the Lord to give their family wisdom in making these choices. Hair color? HAIR COLOR; you ask?! Ask yourself this question: If my teenager wants to try wearing purple hair for a few weeks, does it really change the course of the world? If my young adult wants to live in only blue jeans and t-shirts for months on end, what’s the big deal? In a nutshell, Paul was writing this to the Corinthians to advise them not to use their liberty in a way which might stumble new believers. There might be things which are not necessarily wrong, but would give a bad witness. Where do we draw the line? Unfortunately, there is no black and white – one size fits all – answer. This is where wisdom comes into play. We need to be encouraging our children to seek the Lord in all things and allow us to advise them in such choices. What we ought to be asking ourselves is this: Where is my child’s heart? Is this an act of rebellion or just a fun idea that’s been rattling around in their brain, waiting for an opportunity to be acted upon? If my baby’s heart is right with God, and they’ve sought the Lord in their decision, what is the harm in letting them try something new? There is no danger to their soul; no physical harm involved. My child is merely asking to try something and venture into the unknown. What about all those nay-sayers who might think something’s just a little off in your household, especially when they see the purple hair? Hmm… Well. Does their judgement say more about your child or about themselves? Remember the old saying, “Never judge a book by it’s cover.” My child’s hair may be purple, but the soul underneath would die doing the work of God, and, after all, that’s what it’s all about. Who am I? I am a young lady whose heart is to serve the Lord with all of my being in the role I play as a wife, mother, and teacher. I’m not a fan of colored hair, mainly because if the goal is self expression, hair color is superficial. But I love the reminder to start with the boundaries we all already share. Lots to consider here! Thank you so much for stopping by. Parenting certainly is an adventure isn’t it!!! Awesome read. Though not a parent, I advise them during day to day interactions. Thanks for coming by. What a wonderful job you have!!! And a great opportunity to encourage kids to think about the reasons behind what they choose to do or not do.